HIPAA Final Rule-compliant, our exclusive HIPAA Awareness Cards make compliant behavior clear and easy to understand. Prescribe one card for each employee and alleviate symptoms of HIPAA confusion. How many times have your employees wished someone would just tell them "what to do" or "not to do" about HIPAA? HIPAA Group does exactly that - in simple language and without "fluff" in our new HIPAA Awareness Cards. 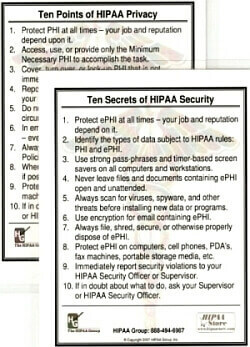 These durable, laminated, pocket-sized cards distill years of expert advice into twenty simple rules for HIPAA behavior: 10 for Privacy and 10 for Security. Protect your practice, clinic, hospital, or nursing home by giving each employee one of these indispensable, up-to-date HIPAA Awareness Cards. Minimize your HIPAA liability and reduce your chances of violations by making sure each employee clearly understands the limits HIPAA places on every-day behaviors. Satisfy your employees' desire to "understand the rules" and do the right thing, by making HIPAA-compliant behavior clear and easy to understand.